The survey is now closed, thanks for your responses! Chances are you overindulged on the various limited edition make-up collections over the festive season, or you were spoiled with some of your most coveted cosmetics at Christmas. If you’re anything like us, your make-up bag is actually a pretty valuable commodity. Count up your spoils and tell us – just how much have you splurged on various lust-have cosmetics, past and present? 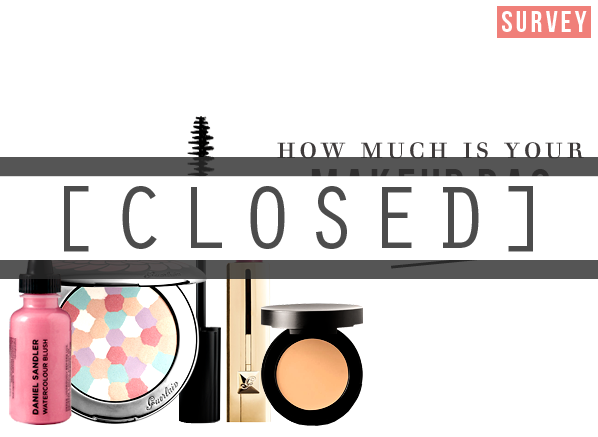 We’d love to know just how much you invest in your make-up routine! As usual give us your thoughts, and we’ll give a £20 Escentual voucher to somebody picked at random from the respondents. Good luck! Only one entry per person (based on IP address) will be counted. Automated entries will be disqualified from the prize draw. One winner will be picked at random. Escentual reserves the right to withdraw any nominations or votes if they feel they are abusing the competition or any of its rules. General Terms & Conditions apply. By entering this survey you are authorising Escentual to sign you up for their email newsletter. Your email address will not be shared with any other companies or 3rd parties. This entry was posted on Thursday, January 3rd, 2013 at 2:00 pm and is filed under Competitions, Make-up, Survey. You can follow any responses to this entry through the RSS 2.0 feed. You can skip to the end and leave a response. Pinging is currently not allowed. This was scary! I don’t usually add up what I spend on the contents of my make-up bag! Thank goodness no one mentioned nail polish! The sad thing is that if you are too close to decent shops which have makeup, the odds of you spending more than you realise is too easy! and the wish list just gets longer. Day 4 of my ‘buy no makeup’ resolution. I take each day at a time. Thats quite a bit of money gone to cosmetics! I only stick to the basics so I don’t spend that much.